Described as a shaggy bundle of energy, the Aussiedoodle is an outgoing family pet that loves their humans as deeply as they love learning. There is very little doubt that the Aussiedoodle fills a life with excitement and love. The Australian Shepherd Poodle, also known as the Aussiedoodle, or Miniature Aussiedoodle, is a small to medium sized dog that is athletic and energetic. This playful breed is known for being intelligent and hard working. They thrive when they have something new to learn and you can teach them any type of trick that you like. In fact, the Aussiedoodle is a natural performer and they do very well in dog competitions and sports including dance, agility and fly ball. The breed is an excellent family dog that has a lot of patience, making them perfect for families with young children. They do have a lot of energy and require a home that can make the time for them when it comes to training and exercise. However, with the proper care, the Aussiedoodle is a versatile breed that fits into almost every lifestyle. Like many designer dog breeds, the Aussiedoodle is a breed that does not have a clear history. We do know that the Aussiedoodle is the result of crossing the Australian Shepherd with the Poodle. The result was the Aussiedoodle, as we know it today. The breed is still quite young and has only been around for the last few decades. While there is no set breed standard for the Aussiedoodle, some breeders are making the effort to create one and produce puppies that align to that standard. As a cross between the Australian Shepherd and Poodle, the Australian Shepherd Poodle can range in appearance depending on the breed that they take after. In general, the breed is a small to large size breed that is athletic in appearance while still looking solid with thick legs and body. The top line should be straight and the dog should have a rectangular shape with it being slightly longer than it is tall. The head should be wide with a thick, rounded muzzle and oval shaped eyes. Eyes can be brown or they can also be the blue that is common in the Australian Shepherd; including have two separate colored eyes. The ears are large and hang down the side of the head. The tail should be thick; however, some are born with the bobtail that is seen in the Australian Shepherd. Overall, the appearance should be a happy, teddy bear like dog. Like many Poodle mixes, the Aussiedoodle can be found in two size varieties depending upon whether the Poodle size used in the breeding. The Miniature Aussiedoodle can be the result of either crossing the Toy or Miniature Poodle with an Australian Shepherd or the result of mixing any type of Poodle (toy, miniature, standard) with a Miniature Australian Shepherd. The Miniature Aussiedoodle ranges in height from 12 to 18 inches and in weight from 15 to 35 pounds. Simply referred to as the Aussiedoodle, the breed is the result of breeding a Miniature or Standard Poodle with an Australian Shepherd. The breed ranges in height from 13 to 23 inches and in weight from 25 to 70 pounds. Like their size and appearance, the coat of the Australian Shepherd Poodle can vary depending on which parent the puppies take after. The coat should be a double coat with a thick, dense undercoat. The topcoat is usually medium to long in length and can be soft and silky, long and wavy or tightly curled like a Poodles. It is important to note that the only coat that is hypoallergenic with the Aussiedoodle is the tight, curly, Poodle-like coat. When it comes to the colors, the Aussiedoodle can be a range of several different colors and can be marked in any type of way including patches, merle, or brindle. They can be found in solid colors or a combination of any of the following colors: black, white, gray, red, yellow, brown, silver and blue. One point to make about the coat is that the Australian Shepherd Poodle can have some striking coat color combinations including: cinnamon merle, blue merle, chocolate and white, red sable, red merle and tricolor (three of any of the above color). Grooming the Aussiedoodle will vary depending on the coat type that your Aussiedoodle has inherited. In general, the coat should be brushed once or twice per week, more often for the curly coat, which should be brushed once a day or at least three times a week. During periods when they are shedding, grooming should be done more frequently for the wavy coat. Many owners opt to shave the coat down into a puppy cut to make maintenance easier with the Aussiedoodle. If you are opting for this grooming option, it should be done every six to eight weeks, along with a bath. Even without the puppy cut, the Aussiedoodle only requires a bath once every month or two. Ears should be checked weekly and cleaned when necessary, as the breed can be prone to ear infections. In addition, teeth should be brushed weekly and nails should be trimmed monthly or as needed. Known for being intelligent and outgoing, the Australian Shepherd Poodle is a devoted family pet that thrives in homes where he can spend time with his owners. The breed is a very friendly and tends to get along with everyone. They love spending time with their owners and are happiest when they are out and about with them. The Aussiedoodle tends to have a high energy but with proper exercise, they can be a very relaxed dog in the house and are happy to just lounge around. While they can have the herding instinct found in the Australian Shepherd, the breed does well with children and often does very well with other pets in the home. Overall, the Aussiedoodle is a sweet and loyal breed that has a limitless well of patience making it an ideal family dog. With lifespan, there has been differences seen depending on the size of your Aussiedoodle. In general, the Aussiedoodle has an average lifespan that reaches between 10 to 12 years. However, the Miniature Aussiedoodle has a longer lifespan that averages 12 to 15 years. As mentioned above, the Aussiedoodle come in two separate sizes and this can affect the number of puppies that an Aussiedoodle can have in a litter. The average litter size for the Miniature Aussiedoodle is between 3 to 5 puppies. Litters tend to be small; however, they can have up to 6 or 7 puppies. 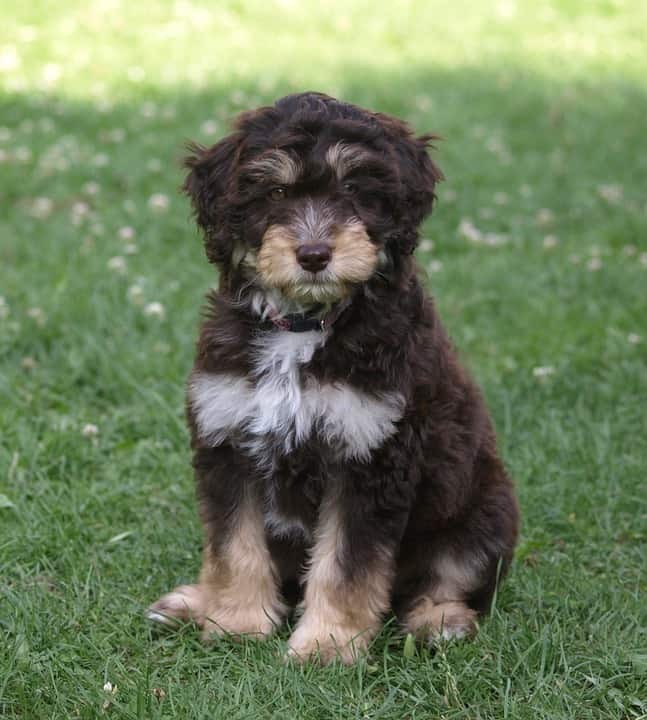 The average litter size for the Standard Aussiedoodle is between 6 to 7 puppies. They are known for having smaller litters of only 2 or 3 puppies but some have had up to 11 puppies in a litter. While the Aussiedoodle is a small to medium sized breed, they are not suited to apartments. The breed can be quite noisy, especially when bored and this can lead to problems if you have noise restrictions. They are better suited to a home with a large fenced yard or acreage. The breed does require daily off leash exercise to help keep their high energy down. The Australian Shepherd is a very intelligent breed that is often eager to please when it comes to training. They do very well learning commands quickly and work well with positive reinforcement. With training, they do require short training periods of 10 to 15 minutes several times a day so they don’t grow bored. In addition, avoid a lot of repetition with commands to keep your Aussiedoodle engaged in training. The breed does require a firm and consistent rule on mouthing and herding. This breed loves to herd and they will nip at children, adults and other pets to get them to move for them. This can cause a lot of problems for dog and owner alike so it is important to train them not to bite. While the Australian Shepherd Poodle is an outgoing and friendly breed, they should still be socialized from a young age to be sure that he is a confident dog as an adult. It is important to mention that a bored Australian Shepherd Poodle can quickly learn bad habits on their own so keep your Aussiedoodle engaged. The Aussiedoodle is a breed with a seemingly endless well of energy that does require a lot of exercise. The breed does very well as a jogging partner once they reach a year old; avoid jogging with them before then to prevent stress on their joints. Even with jogging, expect to exercise your Aussiedoodle between an hour to two hours a day. It is important to give them plenty of exercise both on leash and off. Without proper exercise, they can become quite destructive due to their pent up energy. In addition to exercise, the Aussiedoodle really needs to keep their mind active. Training daily can help with this but also provide them with some problem solving games that will keep them engaged and happy. Again, without their intelligence being challenged daily, they will find things to get into and that could lead to a lot of problems for both owner and dog. Feeding the Australian Shepherd Poodle is quite easy as the breed eats 1 to 3 cups of food every day. It is important to match the formula to the size of the Australian Shepherd Poodle that you have. Miniature Aussiedoodles should have a small breed formula while Aussiedoodles should have a large breed formula. In addition, choose a food with a good fat and protein level so that it is suited for a high-energy breed. Treats of meat, fruit, vegetables, dog bones, etc, can be given daily. If your Australian Shepherd Poodle is getting the proper exercise, you do not have to count the treats into their daily calories, as they will often burn them. Finally, always have fresh water available for your Aussiedoodle. A happy little teddy bear of a puppy is what owners should expect when they find an Aussiedoodle puppy. This is a sweet, fluffy breed when they are young and owners should look for an outgoing puppy with bright eyes. The breed is very intelligent right from a young age and it is very important to puppy proof your house as the Aussiedoodle puppy will find ways to entertain themselves…meaning they are happy to get into trouble in the search for something fun. Like most puppies, the Aussiedoodle will sleep a lot at a young age; however, the breed is very active when they are awake. The Aussiedoodle puppy is often described as having two settings: on and off. When they are up, they are up and ready to go before they crash. For this reason, it is important for you to monitor the activity level and don’t let your Aussiedoodle puppy play too hard while they are still very young. Since this is a working breed, training should start as soon as the Aussiedoodle arrives home and should be done throughout the dog’s life. In addition, strict rules should be followed until the Aussiedoodle is properly trained. With suitability, the Australian Shepherd Poodle is a versatile dog that really does fit into any lifestyle. They do better in a home where they are part of the daily activities and where the owner has the time to spend training and exercising the dog. Without that time, the Aussiedoodle can become very unruly and destructive. They do well with children of all ages and make and excellent family pet. They do need to be trained not to herd and nip but, overall, they are very patient with children. The Aussiedoodle is eager to please so they are usually good for first time dog owners. The only time an Aussiedoodle doesn’t fit into a home is when that home is in an apartment, everywhere else, the Aussiedoodle is the perfect family companion. would like more info. cost, location, etc.